I have written about the relative merits of tea and coffee before, as part of the readers Q&A series. Back in May I informed The Rogue Verbumancer that I saw tea as my staple writing drink, although I tend to kick-start the day with coffee. It was a pretty riveting post. Anyhoo, whilst this remains true, I tend to regard coffee as my rent-paying-job drink (journalism/writing is not my main income yet, but I’m working on it). This is because when I am conducting assorted administrative tasks in an office environment, I need to sporadically re-kick-start myself several times a day as opposed to the once or twice required when penning glorious fictions. I find the immediate caffeine boost of coffee sharpens my focus on envelope stuffing and email-replying better than tea – maybe because over the years I’ve imbibed tea more often and have immunised myself against its effects. Now, mine is not the most sophisticated palate, and to tell you the truth I actively preferred instant to real coffee until about two years ago. I suspected then, as I do now, that coffee is something people grow into, like an unusual face or good brassiere. But this leads me to a question, and the question is this question that I will now posit: why do people drink instant decaf? It tastes basically the same as a bog standard cup of instant, by which I mean adequate at best; yet it has none of the magical curative properties (ie caffeine). 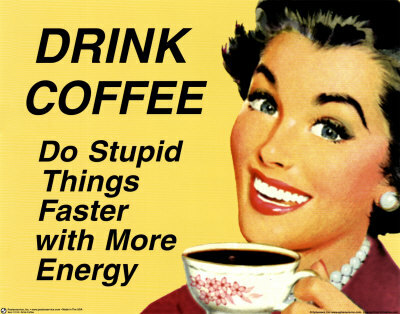 If you don’t want caffeine, why are you drinking coffee? Why have you trained your taste buds to evolve to the point of liking the taste so much that you don’t care whether you get the corresponding hit? Why don’t you just have a mug of warm ribena, or a fancy fruit tea built for purpose? I’m sure there are many reasons, if only I could be bothered to Google them – but I can’t, and therefore we must assume decaf is drunk exclusively by addicts trying to wean themselves off the good stuff in the same way smokers might use nicotine patches. People are always arbitrarily deciding to give up coffee, which seems strangely masochistic to me – like giving up chocolate, or singing along to your favourite song when you’re alone in the house, or happiness – but I suppose it is their prerogative. Still, you can rest assured that 12 books in 12 months would not be happening in a world of decaf – as the image above clearly shows. Here endeth the lesson. I agree with you (And 1storyeveryday) that you grow into it. Hated the darn brew when I was younger! But now I love it – the smell, the taste. It really gets me going in the morning and helps tremendously every time I sit down to write. Like my father (it must be the genes) I stop drinking coffee after 6pm because otherwise I have trouble sleeping. Which is too bad. I would like to drink coffee all day long! I have never tried decaf but I am considering buying some to have after 6pm. Not sure I would enjoy it as much without the caffeine though. Like yourself, I grew into coffee. At 13 I imagined myself to be a “wild and tortured writer.” For some reason I thought that meant I need to ingest buckets of black coffee. As for the issue of decaf, I shall refer to something told to me by a Swedish friend. Apparently the Swedish live on coffee; they’re more likely to have a night out in a coffee bar than go out to the pub. Decaf still has a hit factor but it doesn’t last as long as normal coffee does. Sometimes I have a mug of decaf after dinner on evenings I know I have lots of stuff to do. Not sure if that answers your question but hopefully it gives you some insights. On a side note, I’ve started having cups of herbal/fruit tea when working at the Glasgow Women’s Library. That place really does run on tea!